The HOLO card can hold a pass or stored value in a linked account. Stored value is an electronic alternative to cash. A "smart card" that contains a microprocessor computer chip is linked to an account that can both store electronic currency and process financial transactions. Your account can also store a pass at the same time. When using HOLO, the validator will first check your account to see if you have a valid pass. Next, if you don't have a pass in your account, it will check to see if you have sufficient value to pay for your ride and deduct the fare if you do. We are testing the day pass cap. All you have to do is ride. Every time you pay for your fare, your money goes towards a day pass. Pay for two trips in a day, earn a day pass and the rest of your rides are free until the next day. The validity period for the day pass is from 3:00 am on the first day till 2:59 am on the second. Card and account protection – If your card is lost or stolen, you can easily deactivate the card, set-up a new card with access to your existing pass and or stored value. Reload and purchase passes online. Easily manage multiple cards for your family or group. We are working with many local businesses, agencies and colleges to transition from paper passes to the HOLO card, but they won’t all make the switch at the same time. Your new card will work like your current pass, just tap as you board to show your account is current. If you’re used to getting a pass through work, you’ll just need to remember to tap your HOLO card each time you board, including in the future on rail. Yes – your tap is proof of payment. 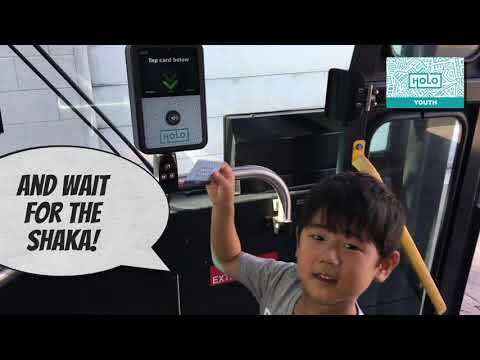 Tap your card at the HOLO card validator located on board the bus, at a device used by your Handi-Van driver and at faregate validators coming soon to rail stations every time you board a bus or train. You will also have to tap to exit the rail faregates in the future. 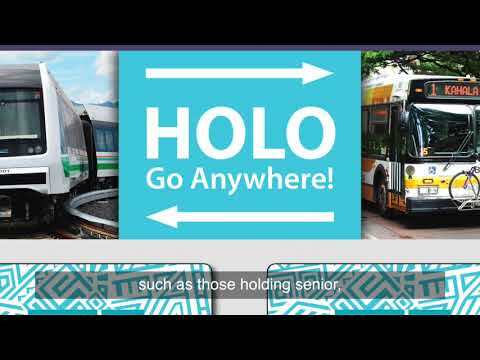 You tap your HOLO card on the HOLO reader on board the bus or Handi-Van or at future rail stations every time you board. You can earn a day pass instead of buying a day pass in advance...You’ll never pay more than the price of a day pass in one day. Monthly passes can be loaded to your account on line, at participating local retailers or at any satellite city hall. You can transfer to any TheBus, Handi-van or future rail station using your HOLO card. No, you can still use cash, and you can continue buying your fare the way you’re used to, except as with the City’s recent fare policy changes you can only take one ride; transfers will not be available. Your HOLO card also lets you save money by earning a day pass as you ride and never paying more than you have to. There are no regular fees or service charges for using HOLO. However, there is a $2 one-time charge for a replacement card, and a $2.75 minimum when loading or reloading money at retail locations. After the initial roll out period, the card will cost $2. Yes. Your personal data and bank information is in a secure database and not on the card itself. If you choose to register your HOLO card, we ask for your first and last name and your email address. We use your anonymous travel data (viewed in aggregate with other riders’ trips) to look at broad ridership trends and help us improve our service. With your permission, we use your transaction data to help you when you contact us with a question about your account. Fare inspectors, supervisors and transit security staff carry smartphones that allow them to check your HOLO card to make sure you paid the fare for your trip. (They’ll ask you to hold up your HOLO card so they can “tap” it with their phone.) They will also ask for ID for proof of eligibility if you’re using a discounted HOLO card like a senior or youth card. Remember that tapping is your proof of payment — that’s why it’s important to do it every time you board and transfer. No, you don’t need the HOLO website to use HOLO. You can also reload your HOLO card at local participating retailers, satellite city halls, TheBus Pass Office at Kalihi Transit Center, and by calling 808-768-HOLO Monday to Friday from 7:30 am to 4:00 pm. Aloha! No, but if you’re going to be in town for a while and you expect to ride frequently, you may want to get a HOLO card so you don’t pay more than you have to. You’ll still earn a day pass after paying for two rides in a day. Or, you can just use value stored in your account to buy a one way ticket when you tap your HOLO card at any on-Board reader and at future rail stations. You can also buy HOLO cards at participating retailers, Satellite City Halls and TheBus Pass Office, as well as at future Ticket Vending Machines (TVMs) at future rail stations. No, you don’t need a bank account to use HOLO. You can buy and reload cards using cash at any of participating retailers, Satellite City Halls, the OTS Customer Service Center and at future Ticket Vending Machines (TVMs) at future rail stations. Adult HOLO cards will be rolling into local participating retailers in spring 2019. Please check back at our website to see locations as they come on board. Senior, Youth, Disabled, Medicare and Handi-Van cards are available at TheBus Pass Office. Satellite City Halls will also issue Senior, Youth and Adult cards in the future. Locations and maps can be found at www.holocard.net. Sorry, cards are not available by mail. Once you have any card type, you can load it at any retail location or on line at www.holocard.net. TheBus Pass Office, Kalihi Transit Center, 601 Middle Street, Honolulu, HI is open weekdays from 7:30 a.m. to 4:00 p.m.
Our HOLO customer service team is available by phone at 1-808-768-HOLO(4656) from 7:30 am to 4:00pm Monday to Friday. There is a $2 charge for new and replacement HOLO cards. During the initial distribution period the cards will be free. HOLO cards contain electronics and cannot be recycled. All HOLO cards are designed to last a minimum of 5 years. Yes. You can still use cash to buy a one way ride on-board TheBus and on scheduled Handi-Van rides. You can also reload your HOLO card using cash at any of the 100+ stores in our retail network,at satellite city halls, TheBus Pass Office at Kalihi Transit Center and at Ticket Vending Machines (TVMs) at future rail stations. The current programs for senior, disability, The Handi-Van, U.S. Medicare and bus pass subsidy programs are still in place for individuals who qualify for the programs. Senior and disability riders that have the reduced fare HOLO card will have the added advantage to load their passes and value electronically or at the 100+ retail locations. Not on TheBus or The Handi-Van. We’ve tried to keep HOLO really simple. Remember to tap on every time you board. At future rail stations, you will need to tap your HOLO card to enter and to exit. You will be charged for your trip on entry. No. Everyone age 6 and up in your group or family needs their own HOLO card to pay a fare. However, you can easily manage multiple cards through one HOLO account on the HOLO website (www.holocard.net). With your HOLO card you can buy a monthly pass at over 100 participating retailers, satellite city halls, and TheBus Pass Office at Kalihi Transit Center. You can also sign up on your account for autoload to automatically load your monthly pass for you and charge your credit or debit card. You can also load value this way too. All you have to do is ride. Once you tap your card more than two times (the price of a day pass) in a 24 hour period (3am to 3am the next day) you will earn a day pass and your account will not be charged any more money till the next day starts. Pay for two trips in a day, you earn a day pass and the rest of your rides are free until the next day. That means you’ll never pay more than the price of a day pass in one day. With HOLO everyone gets the savings of a pass, but without the upfront cost or commitment. 1-Day Passes are valid from 3 a.m the day of first tap until 3 a.m. the following day. Soon, you’ll be able to buy HOLO cards, load value and passes at rail station ticket vending machines located at all entrances to rail stations. These machines will take cash, credit and debit. You can use these machines to reload your card and also to use your pre-tax funds from your employer to purchase passes. Yes, we are planning to phase out paper day passes and monthly passes, but we haven’t decided exactly when. We anticipate phasing them out in 2019. There is a $2.75 minimum when loading money on your HOLO card. If you have a registered HOLO card and it’s ever lost or stolen, let us know immediately by logging in to your account and choosing “Report Lost or Stolen” on the HOLO website www.holocard.net, or give us a call at 1-808-768-HOLO(4656). The balance of a registered card is protected if it is lost or stolen. Once you have reported your card lost or stolen, the previous card will be deactivated and your balance can be transferred to a new card. If your card is registered, we can transfer your money or pass to a replacement HOLO card, pick up a card at the store, at Satellite City Halls or TheBus Pass Office at Kalihi Transit Center then give us a call at 1-808-768-HOLO(4656) or go on line to www.holocard.net. Cards cost $2 each. You can check your HOLO card balance or pass on at www.holocard.net, or by phone at 1-808-768-HOLO (4656). If your HOLO balance is low, you’ll see a yellow warning in the top left corner of the validator after tapping. When you register your card, you can set up autoload, which puts money on your HOLO card whenever your balance dips below a threshold amount that you set up which can be as low as $2.75. You can set up the amount to load to your card with an amount starting at $5.00 when it hits that threshold.That way you’re never stuck without fare. Yep, your balance stays on your HOLO account. We just shut off that card temporarily so nobody can use it. You can log in to your account and select “Reactivate Card” to turn it back on. If you get a new card, call us at 1-808-768-HOLO (4656) and we’ll transfer the balance to your new card. If you registered your card, you can log into your account at www.holocard.net and check your card history. Here you will see that more than two taps in a 24 hour show as a zero value cost ride. This means your account was not debited for any funds and you earned a day pass. When a card is blocked, it goes on a "hotlist". This means when it's tapped at a card reader a negative sound is made and a customer does not have the ability to pay for their ride with their HOLO card. Cards are also blocked by the system if the card was used with insufficient funds. In this case, the card is considered to have gone "negative". When the card has gone "negative" a user has to load to the card to cover the negative amount and add suficient funds to ride again. You can unblock your card by calling the HOLO Call Center at 808-768-4656 (HOLO). If your card is blocked because of insufficient value, you can add value at holocard.net, at a local retailer or at a Satellite City Hall.